Sumner Manufacturing, the industry leader in pipe-handling equipment, announces new Ultra Qwik Clamp & Ultra Qwik Fit models featuring push-button thread adjustment. Houston, TX - The Sumner Ultra Qwik Clamp and Ultra Qwik Fit are based on the highly popular Ultra Clamp and Ultra Fit tools for pipe-to-pipe, pipe-to-fitting, pipe-to-flange and fitting-to-fitting pipe welding fit-ups. Both the Ultra Qwik Clamp and Ultra Qwik Fit feature push-button thread adjustment, a feature that allows users to quickly size-adjust the clamps with the push of a button. Holding the push-button in on the tool housing frees the threading to be adjusted at will to the correct size. Releasing the button allows the user to fine adjust and tighten the tools in the same manner as the Ultra Clamp and Ultra Fit. The push button thread adjustment feature was successfully introduced with Sumner's Hold-E pipe clamp for standard vee head jack stands in early 2012. As with the already successful Ultra Clamp and Ultra Fit, the Ultra Qwik Clamp and Ultra Qwik Fit accommodate three sizes of pipe: 1" - 2-1/2" (25 - 65 mm), 2" - 6" (50 - 150 mm) and 5" - 12" (127 - 300 mm). The Ultra Qwik Clamp and Ultra Qwik Fit have the same lightweight design and a rugged frame built for job site use as the Ultra Clamp and Ultra Fit. Stainless steel alignment screws at all contact points hold fittings in place and allow for fine adjustment. Smooth roller clamping action enables positive gripping and the operating handle repositions for close work. Fit-up settings can be maintained for repeat fit-ups. 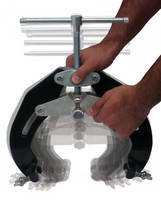 The Ultra Qwik Clamp is for use with pipe-to-pipe, pipe-to-fitting and pipe-to-flange fit-ups. The Ultra Qwik Fit is for use with fitting-to-fitting fit-ups. All Ultra Clamps, Ultra Fits, Ultra Qwik Clamps and Ultra Qwik Fits come with a lifetime warranty. Ultra Qwik Clamps and Ultra Qwik Fits will be available beginning in January 2013. For more information visit www.sumner.com. Founded in 1965 in Houston, TX, Sumner Manufacturing has served the welding and mechanical contracting industry for nearly a half century, creating high quality material lifts, jack stands, pipe fit-up clamps, welding tools, and material carts that are currently used daily in more than 50 countries around the world in numerous industries. All Sumner products are built with the concept of providing safe, common sense tools which are priced right. Sumner Manufacturing maintains offices in Houston, TX, Canada, China, the UK and the Netherlands.